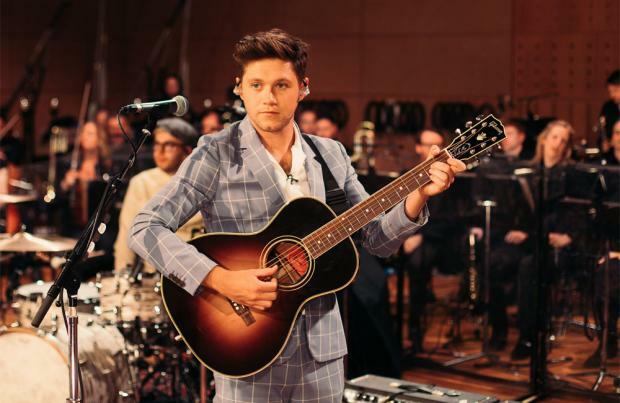 Niall Horan has released a new live album with the RTÉ Concert Orchestra. The 25-year-old musician – who recorded tracks from his 2017 debut solo record 'Flicker' with the 45-piece ensemble last year – has now unveiled the reworked tunes.. He said: "'Flicker' was an album I made that came from the heart and my heart is very much in Ireland. Recording tracks from that album with a 45-piece orchestra was a dream come true and to be able to do it at home with the RTÉ Concert Orchestra, one of the best in Europe, if not the world, was really special. "When recording the album, I could never get the production right on 'So Long'. I played it in tour rehearsals one day and the band joined in with me. "We ended up making a new version which sounds amazing live and has been part of our tour set list. I love that we can finally release a version of it now." The nine-track album features eight reworked songs from the original album, including singles 'This Town' and 'Too Much To Ask'. Niall's debut solo album 'Flicker' was a huge success and hit No.1 in the US and Ireland and Top 3 in the UK. It also went to No.1 on iTunes in 61 countries and sold over 2.5 million albums worldwide. The former One Direction star – who rose to fame in 2011 after appearing on 'The X Factor' – has sold 70 over 70 million records with the group and toured the world. His debut Platinum single 'This Town' – which he released in 2016 – sold more than 6 million track equivalent units globally and his second single 'Slow Hands' went on to sell over 8.5 million. 'Flicker featuring The RTÉ Concert Orchestra' is now out on all digital music services.